A layer between the print and the clear tar gel is not necessary. Once the print has cured for a minimum of 48 hours, you can paint directly on the print with acrylic mediums, such as the tar gel, and with acrylic paints, as well. While a top coat is not essential, it would be beneficial in the long run for giving the print the maximum protection against UV rays and discolouration. For this, you can use Golden Archival Spray varnish, or Golden Polymer varnish which is a brush on version. My apologies for the slow reply, I didn't see this comment until today. If you intend for the final piece to be stretched, I would suggest that the stretching is done prior to applying the tar gel or other mediums to get the tightest stretch. I would also be concerned that the bond between the media and the canvas could be compromised by stretching afterwards. Thanks for your question. We are not able to print directly onto boards as our printers are designed for paper and canvas. We do provide a service that mounts our digital paper prints onto aluminum panel, foam board, and Rynoboard but all currently come laminated so not ideal for the pencil work you'd like to do afterward. The good news is it's easy to mount your prints (both paper and canvas) to the surface of your choice. I use cradled wood panels but this would work just as well on an art board or any hard surface that does not warp easily. This video, Mounting a Digital Print onto a Cradled Panel, shows how. I mount my own prints this way but with a few modifications. I print my images just a fraction larger than the surface I intend to mount them on to get a full bleed to the edge once mounted and trimmed. I first prep my panel by sanding it and then give it 2 coats of Golden GAC 100 to avoid Support Induced Discoloration (SID). And then I glue my print to the board and weight it overnight to ensure a good bond. Once all is dry, I trim the edges and the mounted print is ready to go! Your video was most helpful.....in india we have Golden products available.I tried Golden Tar Gel on one of my digital canvas..... but the moment I touched the canvas with the tar gel the inks came of....I am using a HP Z3200 pigment ink printer, what other golden product will be safe and give me the similar effect like your video. It is hard to pin down what the problem might be without more information. Here are a few possibilities: the ink may not have dried enough, the video suggests 24 hours drying time before applying anything on top. It could be the inks, though if you are using the pigmented HP Vivera inks there shouldn’t be any problems. It could also be that the canvas is not accepting the ink as well as it could. If you try letting it dry thoroughly, and the ink still lifts, you can try spraying on some thinned acrylic medium with a fine mist sprayer, or use a spray varnish and letting it dry thoroughly before applying the tar gel. It is always a good idea to do some small tests before applying to full pieces. If you get your prints printed through the Opus Digital Printing Service we strongly recommend printing on our Unfinished canvas for mixed media work. Our Gloss and Satin finished canvases are best for digital prints alone. You will need to wait at least 24 hours after printing for the ink to fully dry before applying anything to it. It is quite stable after that. That should be all you need, but for extra security you can also prepare your print by spraying on thinned acrylic medium or using spray varnish and allowing that to dry thoroughly as well. It is always a good idea to do some tests on a small print to see if the techniques you want to use will work. After you have finished your piece you should add a final layer of varnish for protection. We recommend stretching before you work on the print, however with acrylic paint you may be abe to stretch after as well, but have to be careful not to damage your work as you do so. For convenience, Opus offers a stretching service when you order your print. Applying paint will be similar to applying medium as in the video. If you would like to learn more about acrylic painting, we have some good books (check in store for a complete list) on the subject, regular free in-store demos, along with a listing of workshops and classes that happen around BC. You’ll first have to create a digital file of your original artwork. You may be able to do this on your own with the proper camara, tripod, and lighting, or you can find a company in your area who documents artwork digitally. Try searching “fine art scanning” along with your city’s name online. To put the gel medium on, get your print printed on the mat or unfinished canvas, and make sure it has dried at least 24 hours after printing before doing anything to it. Then apply your gel medium. You can also apply a coat of diluted acrylic medium before applying your gel medium. It is always a good idea to do some small tests before working on the full piece. I hope this helps. Hi Cliff, thank you for your question. The printer prints like an ink-jet printer with a smooth flat finish. Any texture on the prints would be imparted from the choice of surface. For example, if you print on canvas, there will be a texture from the canvas but not from the ink used to print. I hope that helps to answer your query. And she dipped her paintbrush into water. Moistening the brush with water prior to dipping into the gel will slow the drying of the gel on the brush. This is a big help when cleaning your brush after you have finished painting. Thank you for your question. 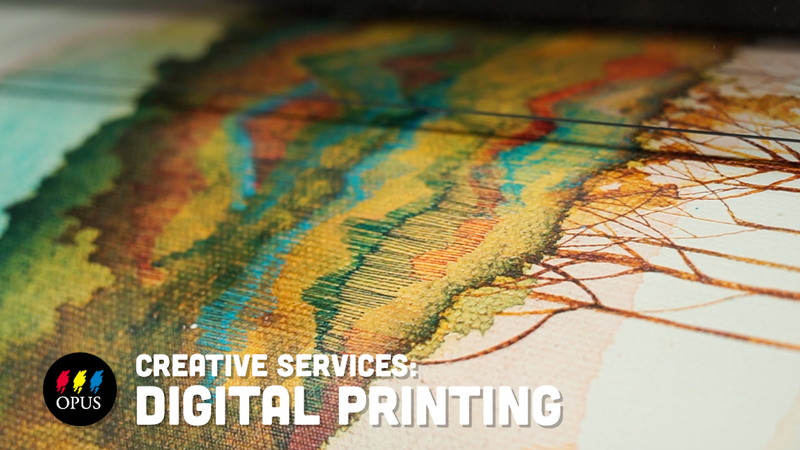 At Opus, we use pigment-based inks that take 24 hours to fully settle and dry. After that, they are stable to paint on with acrylic paints and mediums, without disturbing or altering your print. Applying acrylic paints can help highlight glazes of colour, bring out brush strokes, and enhance your image. If you want extra security for your original print, you can also prepare your print by spraying on a thinned acrylic medium, or use spray varnish and allow that to dry thoroughly as well prior to applying acrylic paints or mediums. It is always a good idea to do some small tests before applying to your full finished work. Thank you for watching and for your question! Golden is a great brand and considered by many of our customers to be the best on the market. They have a wide variety of gel mediums to choose from. Have a look here: http://www.goldenpaints.com/products/medsadds/gels/gels.php for more information. The page also has a video so you can see the different mediums in use. The medium we would recommend as most similar to the Stevenson Acrylic Gloss Gel used in our video would be Golden Regular Gel - Gloss. The Stevenson has a little more body than this one but the next step up, Golden Heavy Body Gel would be quite a bit thicker. The gloss gels do have a lot of sheen but are also clearer than a matte gel and so would provide more clarity for the your print below. It's really a matter of preference and what kind of effect you are trying to achieve so I would suggest experimenting with some sample sizes (or asking at your local art supply store if they have any opened samples in store that you might be able to try on site prior to purchasing) to see which gel will give you the effect that best suits your work and style. Thank you for your question. The Golden Clear Tar Gel has a high gloss finish that dries to be very shiny, and has a stringy and tar-like consistency, which generates really fine, detailed marble-like lines. However, it is not designed to be a final finish. For finishing your piece in matte, we have a few recommendations. In general, it is good to start off with a base layer, known as an isolation coat. The isolation coat is a permanent, glossy coating that separates your surface from removable varnishes, protecting your print. This way, if you make a mistake, you can generally remove it without damaging your print. After applying the isolation coat, you would add several layers of gloss varnish. The reason you would want to first start off with glossy layers is so that you preserve and bring out the colours of your print. Matte varnish, on the other hand, dims the colours, and so it requires a minimum of a base layer to prevent a "frosted" appearance. Applying matte varnish directly onto a print, particularly if you have areas with dark colours, leaves you with this "frosted" look, as it dries opaque. 1. Sanding: Start off with your base layer (isolation coat). We recommend using a Golden Soft Gel (Gloss) for this: apply by diluting 2:1 (2 parts by volume, Soft Gel (Gloss) to 1 part water). Once the isolation coat is completely dry, you can add several layers of a gloss varnish. Make sure you dry each layer, and avoid very humid, hot, or cold environments. Adding several layers will help make your colours pop. Once the top layer has dryed, you can lightly sand the surface, and this will remove some of the shininess of the finished piece, without damaging either the print or its colours. Liquitex and Golden offer great online resources if you want to see how different finishes dry and affect colours. You can also check out Golden's Introduction to Varnishing, which covers some frequently asked questions in regards to proper application, picking the right medium, and more. Please note that it is always recommended that you experiment prior to varnishing on your finished piece, creating samples on a surface similar to your finished piece to see which gel and varnish will give you the desired effects for lustre and transparency, particularly in similar environments - varnishes are highly influenced by temperature and humidity. You could try asking your local art supply store if they have any opened samples that you could try in-store prior to purchasing. Once you have primed your image with the GAC 100 and single layer of clear gesso, you can begin painting. To complete your painting with a matte finish, you can use a matte varnish or Cold Wax Medium after applying your Gamvar Pre-Mixed Picture Varnish, which is used to protect oil paintings. In regards to bleeding, the more acrylic you prime your canvas with, the less dips there will be in the surface for paint to puddle into. Using a thicker oil paint can also help; the greatest risk you run for bleeding is if the oil paints are too fluid, or if your acrylic primer is not thick enough. It is important to note that acrylics are the medium generally recommended when painting on giclee and, as oil painting on giclee is fairly experimental, the best that we can offer are ideas. There is a chance that while short-term bleeding won't happen, there may be long-term effects on the print. It seems that you have already been doing test prints; as always, we recommend that you test any new techniques prior to applying them onto your finished piece. Adding the gel texture to a print is not a service that we offer. However, if you are interested in applying gel texture yourself, you may ask for advice on materials and techniques from Opus staff at any of our stores or by phone via our Mail Order Department. If you are close to our Opus Langley location, they have an upcoming workshop, "Altering Digital Prints to Create a Polished Masterpiece," that may interest you if you decide to pursue applying the gel texture yourself. It takes place on Saturday, September 20, 2014, from 10:30am to 12:30 pm.